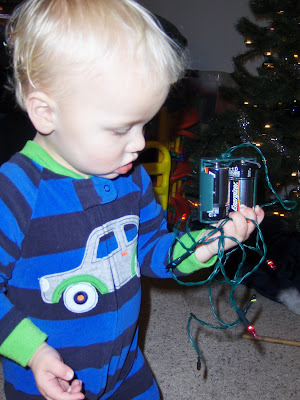 I bought a set of battery powered lights to possibly make a tacky sweater very tacky...but it requires 2 DD batteries. I don't plan on carrying those around with it...so I let Jay play with it. He can turn them off and on, and that is pretty much all he does. I take them away if I am not around watching him. He got a cold this weekend and has a super runny nose. His eyes are all red (around the outside- not in the inside) and he coughs occasionally. My babysitter said he may have a cold that spread to his eyes becuase he rubbed his nose and then eyes. Poor baby. Only one more day of school left and then...CHRISTMAS BREAK! As much as I love teaching, I am always READY for the breaks (especially now that I have Jay). Hope he starts to feel better. ...and we can't wait to see him (and mommy of course!)!!! Grandma and Grandpa S.